i'm almost certain i saw those at Steve Madden a year or so ago. i have zilch idea but i'd love to find out! ...if rembr correctly, i found some studded boots...not quite like the ones you posted...in psycho sisters....a vintage store in lil 5 points/lilburn/and sandy srings. Hmm...you may have to do some yourself, girlie. 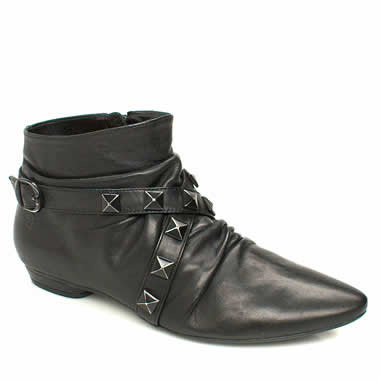 It's not that difficult to stud shoes, though, so if you find some in that style, get some studs and go for it. I did a quick search at Zappos, and didn't turn up much. Sorry, Ariel! We'll keep our eyes open for you! timmy: I'll look in lil 5.
fashion fille: yeah, if I find them, I'll let you know. enc + asiancajuns: you guys are amazing! Thanks! instantvintage: I think you may be right. That or I'll shell out the moeny for it. I don't know where to find them but I really like them! Nordstrom Rack. All about the Nordstrom Rack. It's Bronx, isn't it? I kkow where you can find them in Poland : www.butyk.pl, but I'm not sure if they're shipping to US.